We are so excited to be able to give away EACH of the items that we reviewed! That is a HUGE value for this ONE giveaway prize. THAT is an amazing prize package! One winner takes it ALL!!! Enter NOW!!!! I've tried Sibu in the past and I'm a huge fan! I would be excited to get the MEN'S SHAVING KIT for my husband! I most want to try the Sea Buckthorn Seed Oil. id really like to try the beauty mask!! I'm most excited to try the Cellular Support. I am most excited to try the cellular support. I want to try the exfoliating scrub! I'm interested in trying the Cleanse & Detox Facial Soap. I'd most like to try the Sibu Beauty Acne/Rosacea Kit for my teenager. I'd love to try the SIBU OMEGA-7 CHOCOLATES http://www.sibubeauty.com/sibu_omega-7_chocolates.php they look yummy. I would like to try Face & Body Bar. The replenishing night cream sounds great, I have been trying new facial moisturizers and this one sounds amazing. The only product I have tried is their facial cleanser which I love. A bottle lasts a long time. Marthalynn mentioned a men's shaving kit. Must be a new product coming soon. I don't see on their website. 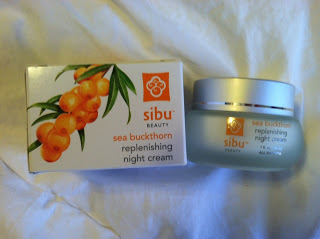 I would love to try their Sea Buckthorn Replenishing Night Cream. Would love to try the facial cleanser. I'd like to try the Omega 7. I would love to try the Sea buckthorn age defying eye cream!